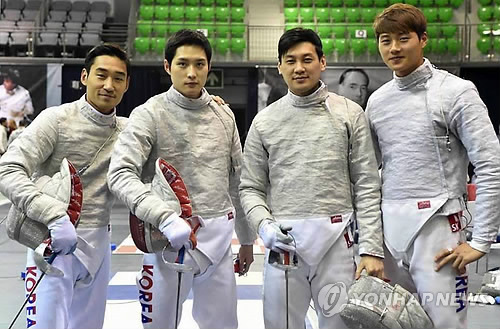 South Korea defended its world title in the men's team sabre fencing in China on Wednesday. The quartet of Kim Jung-hwan, Gu Bon-gil, Kim Jun-ho and Oh Sang-wuk defeated Italy 45-39 in the final held at the World Fencing Championships in Wuxi, China. South Korea won its first men's sabre team title last year and has remained at the top of the game in 2018. Kim Jung-hwan, the senior member of the team at 34, became a double gold medalist, having earlier won the individual sabre gold medal. He is also the first South Korean fencer to win both the individual and team gold medal at the same world championship. Elsewhere on Wednesday, the South Korean women's epee team took silver. Choi In-jeong, Kang Young-mi, Lee Hye-in and Shin A-lam fell to China 25-21 in the final. This was only South Korea's second world championship medal in women's epee. With four team events left, South Korea has won two gold, one silver and two bronze, already its all-time high at a single world championship. The previous record was four medals -- one gold and three bronze -- at the 2010 event.